WASHINGTON (The Nil Admirari) - Earlier today, President Obama sent his annual message to Congressional Republicans asking them "not to shut down the government again." Obama's handwritten letter explained to Republicans they had control of both chambers of Congress, so they needed to "get their act together, stop being drama queens, and pass some bills that actually have a chance of being signed by me." "Republicans control Congress due to one of the lowest voter turn outs this country has ever seen, and a ton of GOP gerrymandering. They know I will not sign anything that makes cuts to domestic programs while throwing more money at defense spending. So I expect exactly those types of bills to move forward as we get closer to the October 1st deadline," stated Obama. 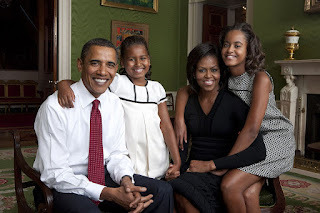 President Obama with his family in the Green Room of the White House (2009). Obama added, "Then they will blame Democrats, especially me, because they tried to pass legislation that can only survive in teabagger fantasyland. And those Tea Party folks will say not especially nice things about me while they keep demanding Republicans cut funding to social programs the teabaggers use." President Obama sent Senate Majority Leader Mitch McConnell (R-KY) a bottle of bourbon and Speaker of the House John Boehner (R-OH) a jug of Carlo Rossi Chablis along with the letter asking them to keep the government running. McConnell criticized Obama for getting him "a cheap bottle of Jim Beam White Label," and Boehner slammed the president for buying him "a jug of wine from a winery I already own."